All men dream,but not equally. Those who dream by night in the dusty recesses of their minds wake in the day to find that it was vanity. But the dreamers of the day are dangerous men, they act out their dreams and make them reality. The great grand mother of Ankarath Tharavad , Kunju Lakshmiamma, of Narikkode Bhavanam was the wife of Kunjunni Thampuran of Mankada Kovilakam. She was born in Kuruva Amsa desam, close to Angadippuram. After Kunjunni Thampuran passed away, she shifted to Kinavallur with her sons, Krishnan Menon and Raman Menon. There, they bought some properties of Kulathunkal Moose and built “Narikkode Bhavanam” on the northern side of the property. After they came of age, Krishnan and Raman joinedCalicut kutchery. When the then collector, Mr. Monroe became the Diwan of Cochin, Krishnan and Raman were given employment and brought over to Cochin. During that time, properties belonging to Ankarath Mannadi in Nallepilly were taken over by the government as there were no heirs in the family. And so, the government could not collect any revenue from those properties. These properties were also collateral for some loans. In these circumstances, Narikkode Bhavanam Kunju Lakshmi Amma applied to the government to hand over these properties to her and in return, she shall pay off the liabilities and revenue income to the government. This was sanctioned by the government of Cochin and it ordered that all properties belonging to Ankarath Mannadi be transferred to Kunjulakshmi amma and her sons (985 ME – 1810 AD). Chondath Mannadiar and some others protested against this government order, but in vain. Krishnan Menon, who was then working in Chittur Taluk as a village officer started staying in Nallepilly with his mother, Kunjulakshmi Amma. Raman Menon was working then as Sarvadhi karya kar (assistant to the Raja). Once, Sarvadhi karya kar Nadavarambu Kunju Krishna Menon had a difference of opinion and fell out of favour with the King. The King suspected Raman Menon and Krishnan Menon to be helping Kunju Krishna Menon and hence, relieved them of all responsibilities. Moreover, all properties belonging to Ankarath were repossessed by the government. 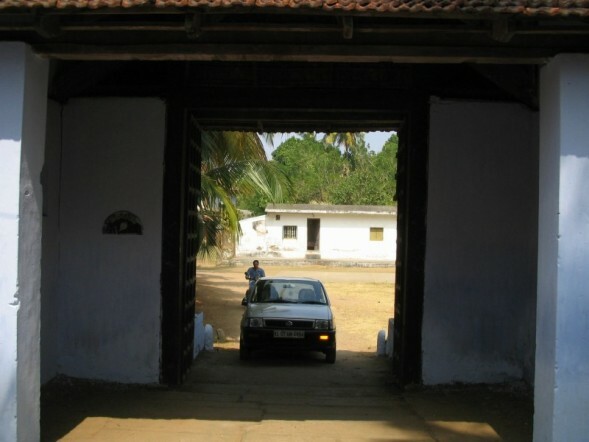 Krishnan Menon and his mother, Kunju Lakshmi Amma had to leave Nallepilly and shift to Narikkode Bhavanam in Kinavallur. Since they were not guilty, Raman Menon and Krishnan Menon appealed against the King’s order to the Resident and the Diwan. In the investigations which followed, Raman Menon’s and Krishnan Menon’s innocence was proved. But, the King was still not satisfied. Later, upon advice from the Resident, Raman Menon went to Travancore to work. He worked as an advocate in the kutchery in Quilon. And later, he was appointed judge in Alleppey court. When he learnt about the demise of his mother due to illness caused by old age, he traveled to Kinavallur. With his elder brother, Krishnan Menon, he performed the last rites of his mother. The 16th day rites were performed not at Pudumana Madom, but at Tekkinedath temple. Brahmana sadya, danams etc. were performed. Kunjulakshmi amma’s first yearly rites were also performed at Tekkinedath temple. Raman Menon was widely acclaimed as a honest and sincere officer and he was promoted up the order. Before becoming the acting Diwan of Travancore (1816-17), he worked as Diwan Peshkar and Dalawa. When he was working as Dalawa, he had to deal with the Travancore – Cochin boundary dispute. As he handled the case for Travancore very well in the Resident’s court, the Cochin Raja felt very concerned. He decided to pacify Raman Menon. “Veera Shringhala” to Krishnan Menon. He restored the diginity and respect towards Ankarath family. Krishnan Menon was posted as Tahasildar in Chittur with all powers. And once again, Krishnan Menon started staying in Nallepilly (1003/1828). They built a nalukettu and pattayapura, but the family faced extinction because there were no lady members. It was decided to adopt some one and after extensive consultations, and upon suggestion from Ramam Menon, Krishnan Menon’s children with Pariyaram Chimmu Amma were adopted. After Krishnan Menon’s and Raman Menon’s mother, Kunjulakshmi Amma passed away, her idol made in panchaloham was kept in the “machu” in the nalukettu at Narikkode Bhavanam. Daily poojas were done there and once in a year, “Shakteya Pooja” was also being done. When this building was broken down about 30 years back, the idol was moved to a newly constructed building. This building was later rehabilitated with help from family members and neighbours. He was known by the name Dalawa Raman Menon. Him and his elder brother Krishnan Menon were the sons of Kunju Lakshmi Amma who was from Kuruva Amsa Desam near Angadippuram. Their father who was from the Royal family of Mankada had passed away at a young age. After completing their education, both Krishnan and Raman joined the Hajur Court in Kozhikkode. Collector Monroe became pleased with the smartness of Raman and Krishnan. Later when Monroe became the Diwan in Cochin State, he invited them to Cochin with responsible positions in the Diwan’s accounts and revenue departments. Krishnan Menon was offered the post as Tahasildar in Nemmara and Chittur, which fell under the Taluk of Chittur. Raman Menon worked in the office of Kunji Krishna Menon, who was the Finance Controller of the Diwan. Though the Finance Controller Nadavarambu Kunji Krishna Menon was smart and up to his job, he rubbed some wrong shoulders with powers that be. Kunji Krishna Menon’s enemies leveled serious allegations against him with the Maharaja of Cochin. The Maharaja called for his Diwan and instructed him to investigate the allegations leveled against the Finance Controller Nadavarambu Kunji Krishna Menon. The Diwan asked Kunji Krishna Menon to put up the accounts and details about specific allegations which were leveled against him . Even though the Diwan reported about his findings to the Maharaja, he was not impressed with what the Diwan had to report. Kunji Krishna Menon’s detractors had very strongly impressed upon the Maharaja that he was not capable to run the office of the Finance Controller. The Maharaja’s opinion about Nadavarambu Kunji Krishna Menon was based on the wrong advices given to him by Kunji Krishna Menon’s enemies. In due course the Maharaja learned that the papers and accounts put up for the Diwan’s enquiry was actually made by Raman Menon. This enraged the Maharaja even more. The Maharaja ordered the removal of Nadavarambu Kunji Krishna Menon from the position of Financial Controller in the Diwan’s office along with his subordinate, Raman Menon. Such was the rage of the Maharaja that he also retired Raman Menon’s elder brother Krishnan Menon from his duties as the Tahasildar of Nemmara and Chittur. 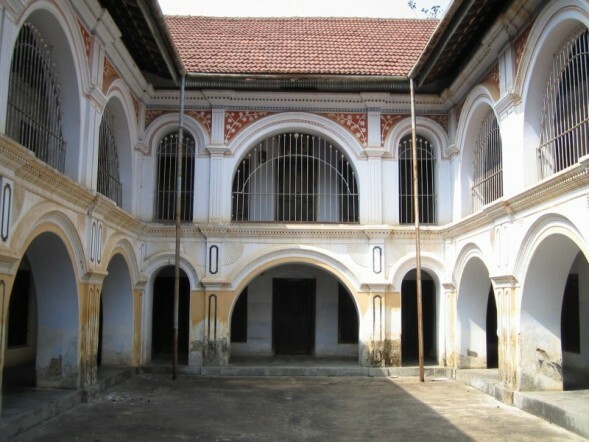 He ordered that the property and assets which belonged to Raman and Krishnan Menon at Nallepilly Ankarath be transferred to the possession of the Government. Raman Menon fought against his unlawful removal from duties. He appealed to the Resident against the action of the Maharaja. His argument was that he only put the accounts and files as required by the Diwan for his inspection and that he never indulged himself in irresponsible activities which brought about any negative consequence to the state. The Resident who looked into the case also opined that Raman Menon willfully committed no offence and that his appeal had substance in it. But inspite of all this, the Maharaja’s order that Raman Menon be removed from his position was not repealed. Seeing that the Maharaja would not change his mind, Resident Monroe, who believed that Raman Menon was a responsible and upright officer offered him a position in Travancore State. He worked for sometime in Alleppey as an Advocate and later on as a Judge. He cultivated an image for himself as being lawful and someone who cannot be prejudiced. Many high positions in the state of Travancore came his way in due course. Later on he served as the Financial Controller in the Diwan’s office and also became the Dalawa. During the time he served Travancore as Diwan, he had to take a strong stance favouring Travancore in a boundary dispute. He presented his case very well in the Resident’s Court. The then Maharaja of Cochin, who learnt that the case was going Travancore’s way got very concerned. He enquired what reason could be behind the sudden urgency about the boundary dispute which was dormant for a long time. Eventually he learnt that the man behind this was the Diwan of Travancore and that he actually hailed from the state of Cochin. The Maharaja of Cochin decided to pacify Raman Menon. The Maharaja sent for Raman Menon, but he refused to appear before him. Raman Menon told the messenger to inform the Maharaja that he was an employee of “Padmanabha Dasan” (Maharaja of Travancore) and that if he had the consent of his Regent Queen, he would go anywhere and meet anyone. Upon hearing this reply Maharaja of Cochin enquired about what Raman Menon’s displeasure with the state of Cochin could be. It was then that he learnt about the unlawful treatment meted out by his uncle, who was the ruler at that time to Raman Menon and his family. He learnt that Raman Menon actually hailed from the state of Cochin and that he had served the state of Cochin diligently in the past. He also learnt that Raman Menon and his family had to flee to Kinavallur owing to the unethical and unlawful treatment handed out to him by his uncle, the then Maharaja of Cochin. Upon understanding the full background and reasons to Raman Menon’s ill feelings towards the state of Cochin, the current Maharaja decided to correct the situation. He reinstated Raman Menon’s elder brother Krishnan Menon in his previous position with better conditions of service. He also ordered that all properties taken away the Government be returned to the rightful owners – the family of Krishnan Menon. This news was conveyed to Raman Menon. In lines with Raman Menon’s instructions to his messenger, the Queen of Travancore was officially handed an invitation for Raman Menon. A request seeking the consent of the Queen was also forwarded to the Resident. Raman Menon’s visit to Cochin was duly authorised to by the Queen of Travancore. Later when Raman Menon traveled, he was received at the Travancore – Cochin border with full state honours. The Maharaja of Cochin bestowed all honours upon Raman Menon and adorned him with a “Veera Shringhala”. (A picture of the same Veera Shringhala has already been posted on this website). Raman Menon was also honoured with the title of “Mannadi Nair”. His family was bestowed with many honours and his brother Krishnan Menon was awarded with a plush job at Chittur. Raman Menon, who was appointed Judge in the Hajur Court in 995 ME/ AD 1820 was elevated to the position of Diwan in place of Krishna Rao, who later passed away. But some immoral elements within the palace forced the Queen to keep on extending his probationary period. Rani Parvatibai had reservations about confirming a courageous and efficient Raman Menon as the full time Diwan. If duty demanded, the Queen knew that Raman Menon would not entertain the whims of even the Britishers in matters of governance. Because of this the Queen feared that the Britishers would be unhappy with the state of Travancore and hence appointed Madhava Rao in place of Raman Menon. While he was Diwan, he fell out of favour with the then Resident Monroe. Monroe was very happy with Raman Menon about his governance and being the Diwan. Captain Gordon, who had the charge of the Forestry Department as well as Development issues had scant regard for the laws of the state of Travancore and refused to follow established policies and procedures. Raman Menon as Diwan had to take Captain Gordon to task and to strictly warn him. Resident Monroe did not like the fact that Raman Menon took Captain Gordon (a European and more importantly a Britisher) to task. Because of this incident Monroe expressed unhappiness in confirming Raman Menon as the Diwan. After he was not confirmed as Diwan, though he was offered the position of Dalawa, Raman Menon did not accept it. He said that he was happy drawing a pension of Rs.175 on account of his position as “Sirastadar” in the Hajur court of Kozhikode and was not interested to work as Dalawa under Madhava Rao for a salary of Rs.1,000. After retirement he settled at Harippad in his own house. He was a diabetic and had to travel to Kollam for treatment. He passed away at Ashramam in Kollam on the 9th of Edavam in 1004. Raman Menon's decendants still reside in Kottayam and Haripad, many of them highly accomplished and successful. One of the great ancestors of the Ankarath Tharavad, Ankarath Ramanunny Mannadinair, Kuttamma as he was called by the members of the tharavad and DSP Mannadinair by the public, he entered police services as Sub Inspector to the earstwhile kingdom of Cochin. He would hold many senior positions including the chief of the Viyuur Central Jail before retiring as the Chief of Police of the Cochin state. He was married to Ambat Gauri Amma. He has only one daughter, Ambat Sulochana who was married to Professor Bhagyanath. His grand children, Madhu Ambat and Vidhubala Ambat would go on to become celebrities in their own right with Madhu becoming a Cameraman and Director of International Repute and Vidhubala one of the most celebrated actress of the malayalam film industry. Another member of the Ankarath Tharavad, Ankarath Ramanunni Mannadinair is a highly accomplished musician and a man of varied talents. He was the first President of Nallepilly Panchayath. He was married to late Parvathi Amma ( Ammukutty Amma). He is survived by his tree children, Rugmani Devi ( Ammini) who is married to noted Cardio- Thoracic Surgeon, Dr Achuthan Nair. His second son is Advocate Madan Mohan, one of the senior counsels of the Palakkad Bar.He is married to Sharadha. His third child is Maya. She is married to Hari Krishnan, son of Kavalam Narayana Panicker. Another member of the Ankarath Tharavad, Ankarath Shankunni Mannadinair retired as the commissioner of HRNC board. gynecologists widely believed to be one of the best doctors presently in Kerala. A member of the tharavad, A.C.C Unny retired as the Secretary of Law, Ministry of Law and Justice, Government of India. He is world famous for his deep understanding and expertise in law.